Mumbai, April 12: At a time when the struggling-to-stay-afloat Jet Airways has created a capacity short fall in the Indian aviation sector, SpiceJet is set to induct 16 Boeing aircraft on lease in the next 10 days. 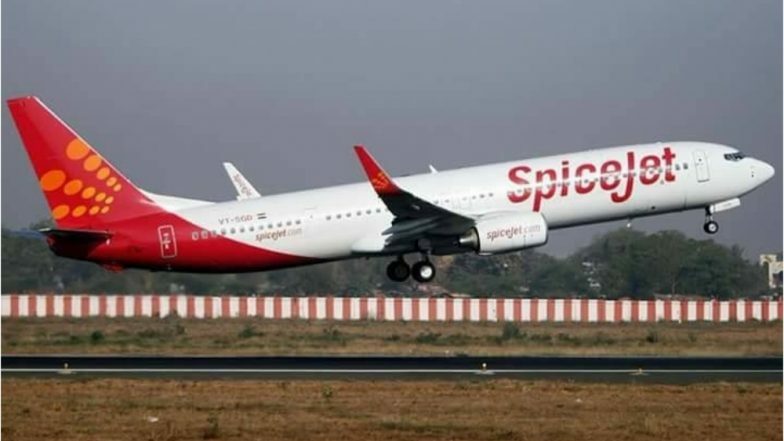 The company said in a BSE filing on Friday, that SpiceJet will induct 16 Boeing 737-800 NG aircraft on dry lease and has applied to the Directorate General of Civil Aviation (DGCA) for a No Objection Certificate (NOC) to import the aircraft. Scrips of SpiceJet advanced over 10 per cent on this news. It was trading at Rs 110.40 per share, up by Rs 9.15 or 9.04 per cent during the afternoon session. "Subject to regulatory approvals, the aircraft would begin joining SpiceJet fleet in the next 10 days." "This is the first lot of Boeing 737s that we are inducting in our fleet. The sudden reduction of aviation capacity has created a challenging environment in the sector," Ajay Singh, Chairman and Managing Director, SpiceJet said. SpiceJet Aircraft Damaged in Turbulent Weather. The debt-ridden Jet Airways fleet size is down to 14 aircraft from around 120 last year. Jet is in the midst of a severe liquidity crisis that has affected its operations and resulted in the grounding. On Thursday, Jet suspended all its international flights, raising fresh fears about the survival of the airline.